Harold II (or Harold Godwinson) (Old English: Harold Godƿinson; c. 1022 – 14 October 1066), was the last Anglo-Saxon King of England. Harold reigned from 6 January 1066 until his death at the Battle of Hastings on 14 October, fighting the Norman invaders led by William the Conqueror during the Norman conquest of England. His death marked the end of Anglo-Saxon rule over England. Harold was a powerful earl and member of a prominent Anglo-Saxon family with ties to King Cnut. Upon the death of Edward the Confessor in January 1066, the Witenagemot convened and chose Harold to succeed; he was crowned in Westminster Abbey. In late September he successfully repulsed an invasion by rival claimant Harald Hardrada of Norway, before marching his army back south to meet William the Conqueror at Hastings some two weeks later. Harold was a son of Godwin, the powerful Earl of Wessex, and Gytha Thorkelsdóttir, sister-in-law of King Cnut the Great of England and Denmark. Gytha's brother was Ulf Jarl, who was married to Cnut's sister Estrith. This made Ulf the son-in-law of King Sweyn Forkbeard, and the father of King Sweyn II of Denmark. Godwin was the son of Wulfnoth, probably a thegn and a native of Sussex.Edmund Ironside, but switched to supporting King Cnut by 1018, when he was named Earl of Wessex by Cnut. Godwin remained an earl throughout Cnut's reign, one of only two earls to survive to the end of Cnut's reign. On Cnut's death, Godwin originally supported Harthacnut instead of Cnut's initial successor Harold Harefoot, but managed to switch sides in 1037, although not without becoming involved in the murder of Alfred Aetheling, half brother of Harthacnut and younger brother of the later King Edward the Confessor. When Harold Harefoot died, Harthacnut became king and Godwin's power was imperiled by his earlier involvement in Alfred's murder, but an oath and large gift secured the new king's favour for Godwin. Harthacnut's death in 1042 likely involved Godwin in a role as kingmaker, helping to secure the English throne for Edward the Confessor. In 1045, Godwin was at the height of his power, when his daughter Edith was married to the king. Godwin and Gytha had several children. The sons were Sweyn, Harold, Tostig, Gyrth, Leofwine, and Wulfnoth. There were also three daughters: Edith of Wessex, originally named Gytha but renamed Ealdgyth (or Edith) when she married King Edward the Confessor; Gunhild; and Ælfgifu. The birthdates of the children are unknown, but Sweyn was the eldest and Harold was the second son. Harold was aged about 25 in 1045, which makes his birth date around 1020. Edith married Edward on 23 January 1045, and around that time Harold became Earl of East Anglia. Harold is called "earl" when he appears as a witness in a will, that may date to 1044, but by 1045 Harold regularly appears as an earl in documents. One reason for his appointment to East Anglia may have been a need to defend against the threat from King Magnus the Good of Norway. It is possible that Harold led some of the ships from his earldom that were sent to Sandwich in 1045 against Magnus. Sweyn, Harold's elder brother, had been named an earl in 1043. It was also around the time that Harold was named an earl that he began a relationship with Edith, who appears to have been the heiress to lands in Cambridgeshire, Suffolk and Essex, lands in Harold's new earldom. The relationship was a form of marriage that was not blessed or sanctioned by the Church, known as more Danico, or "in the Danish manner", and was accepted by most laypeople in England at the time. Any children of such a union were considered legitimate. Harold likely entered the relationship in part to secure support in his new earldom. In 1047 Harold's elder brother Sweyn was exiled after abducting the abbess of Leominster. Sweyn's lands were divided between Harold and a cousin, Beorn. In 1049, Harold was in command of a ship or ships that were sent with a fleet to aid the German Emperor Henry III against Count Baldwin V of Flanders, who was in revolt against Henry. During this campaign, Sweyn returned to England and attempted to secure a pardon from the king, but Harold and Beorn refused to return any of their lands, and Sweyn, after leaving the royal court, took Beorn hostage and later killed him. When in 1051 Earl Godwin was sent into exile, Harold accompanied his father and helped him to regain his position a year later. Then Godwin died in 1053, and Harold succeeded him as Earl of Wessex (the southern third of England). This arguably made him the most powerful figure in England after the king. In 1058, Harold also became Earl of Hereford and replaced his late father as the focus of opposition to growing Norman influence in England under the restored monarchy (1042–66) of Edward the Confessor, who had spent more than 25 years in exile in Normandy. He led a series of successful campaigns (1062–63) against Gruffydd ap Llywelyn of Gwynedd, the ruler of Wales. This conflict ended with Gruffydd's defeat and death in 1063. HAROLD SACRAMENTUM FECIT WILLELMO DUCI ("Harold made an oath to Duke William"). (Bayeux Tapestry) This scene is stated in the previous scene on the Tapestry to have taken place at Bagia (Bayeux, probably in Bayeux Cathedral). 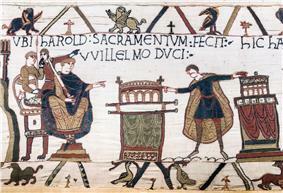 It shows Harold touching two altars with the enthroned Duke looking on, and is central to the Norman Invasion of England. In 1064, Harold apparently was shipwrecked at Ponthieu. There is much speculation about this voyage. The earliest post-conquest Norman chroniclers report that King Edward had previously sent Robert, Archbishop of Canterbury, to appoint as his heir Edward's maternal kinsman, William of Normandy, and that at this later date Harold was sent to swear fealty. Scholars disagree as to the reliability of this story. William, at least, seems to have believed he had been offered the succession, but there must have been some confusion either on William's part or perhaps by both men, since the English succession was neither inherited nor determined by the reigning monarch. Instead the Witenagemot, the assembly of the kingdom's leading notables, would convene after a king's death to select a successor. Other acts of Edward are inconsistent with his having made such a promise, such as his efforts to return his nephew Edward the Exile, son of king Edmund Ironside, from Hungary in 1057. Later Norman chroniclers suggest alternative explanations for Harold's journey: that he was seeking the release of members of his family who had been held hostage since Godwin's exile in 1051, or even that he had simply been travelling along the English coast on a hunting and fishing expedition and had been driven across the Channel by an unexpected storm. There is general agreement that he left from Bosham, and was blown off course, landing at Ponthieu. He was captured by Count Guy I of Ponthieu, and was then taken as a hostage to the count's castle at Beaurain, 24.5 km up the River Canche from its mouth at what is now Le Touquet. Duke William arrived soon afterward and ordered Guy to turn Harold over to him. Harold then apparently accompanied William to battle against William's enemy, Conan II, Duke of Brittany. While crossing into Brittany past the fortified abbey of Mont Saint-Michel, Harold is recorded as rescuing two of William's soldiers from quicksand. They pursued Conan from Dol de Bretagne to Rennes, and finally to Dinan, where he surrendered the fortress's keys at the point of a lance. William presented Harold with weapons and arms, knighting him. The Bayeux Tapestry, and other Norman sources, then record that Harold swore an oath on sacred relics to William to support his claim to the English throne. After Edward's death, the Normans were quick to point out that in accepting the crown of England, Harold had broken this alleged oath. The chronicler Orderic Vitalis wrote of Harold that he "was very tall and handsome, remarkable for his physical strength, his courage and eloquence, his ready jests and acts of valour. But what were these gifts to him without honour, which is the root of all good?" 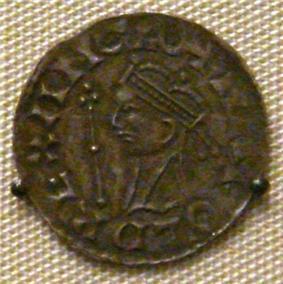 Due to a doubling of taxation by Tostig in 1065 that threatened to plunge England into civil war, Harold supported Northumbrian rebels against his brother, Tostig, and replaced him with Morcar. This strengthened his acceptability as Edward's successor, but fatally split his own family, driving Tostig into alliance with King Harald Hardrada ("Hard Ruler") of Norway. For some twenty years Harold was married More danico (Latin: "in the Danish manner") to Edith Swannesha (Edith the Fair) and had at least six children with her. The marriage was widely accepted by the laity, although Edith was considered Harold's mistress by the clergy. About January 1066, Harold married Edith (or Ealdgyth), daughter of Ælfgar, Earl of Mercia, and widow of the Welsh prince Gruffydd ap Llywelyn. Edith had two sons—possibly twins—named Harold and Ulf (born around November 1066), both of whom survived into adulthood and probably lived out their lives in exile. After her husband's death, Edith is said to have fled for refuge to her brothers, Edwin, Earl of Mercia and Morcar of Northumbria, but both men made their peace with King William initially before rebelling and losing their lands and lives. Edith may have fled abroad (possibly with Harold's mother, Gytha, or with Harold's daughter, Gytha). Harold's sons, Godwine and Edmund, fled to Ireland and then invaded Devon, but were defeated by Brian of Brittany. At the end of 1065 King Edward the Confessor fell into a coma without clarifying his preference for the succession. He died on 5 January 1066, according to the Vita Ædwardi Regis, but not before briefly regaining consciousness and commending his widow and the kingdom to Harold's "protection". The intent of this charge remains ambiguous, as is the Bayeux Tapestry, which simply depicts Edward pointing at a man thought to represent Harold. When the Witenagemot convened the next day they selected Harold to succeed, and his coronation followed on 6 January, most likely held in Westminster Abbey; though no evidence from the time survives to confirm this. Although later Norman sources point to the suddenness of this coronation, the reason may have been that all the nobles of the land were present at Westminster for the feast of Epiphany, and not because of any usurpation of the throne on Harold's part. In early January 1066, hearing of Harold's coronation, Duke William II of Normandy began plans to invade England, building 700 warships and transports at Dives-sur-Mer on the Normandy coast. Initially, William could not get support for the invasion but, claiming that Harold had sworn on sacred relics to support his claim to the throne after having been shipwrecked at Ponthieu, William received the Church's blessing and nobles flocked to his cause. In anticipation of the invasion, Harold assembled his troops on the Isle of Wight, but the invasion fleet remained in port for almost seven months, perhaps due to unfavourable winds. On 8 September, with provisions running out, Harold disbanded his army and returned to London. On the same day Harald Hardrada of Norway, who also claimed the English crown joined Tostig and invaded, landing his fleet at the mouth of the Tyne. The invading forces of Hardrada and Tostig defeated the English earls, Edwin of Mercia and Morcar of Northumbria, at the Battle of Fulford near York on 20 September 1066. They in turn were defeated and slain by Harold's army five days later at the Battle of Stamford Bridge, Harold having led his army north on a forced march from London in four days and having caught them by surprise. According to Snorri Sturluson, before the battle a man bravely rode up to Harald Hardrada and Tostig and offered Tostig his earldom if he would but turn on Harald Hardrada. When Tostig asked what his brother Harold would be willing to give Harald Hardrada for his trouble, the rider replied that he would be given seven feet of ground as he was taller than other men. Harald Hardrada was impressed with the rider and asked Tostig his name. Tostig replied that the rider was none other than Harold Godwinson. According to Henry of Huntingdon, "Six feet of ground or as much more as he needs, as he is taller than most men", was Harold's response. It is, however, unknown whether this conversation ever took place. Harold's death depicted in the Bayeux Tapestry, reflecting the tradition that Harold was killed by an arrow in the eye. The annotation above states Harold Rex Interfectus Est, "Harold the King was killed". On 12 September William's fleet sailed. Several ships sank in storms, and the fleet was forced to take shelter at Saint-Valery-sur-Somme and wait for the wind to change. On 27 September the Norman fleet finally set sail for England, arriving, it is believed, the following day at Pevensey on the coast of East Sussex. Harold's army marched 241 miles (386 kilometres) to intercept William, who had landed perhaps 7000 men in Sussex, southern England. Harold established his army in hastily built earthworks near Hastings. The two armies clashed at the Battle of Hastings, at Senlac Hill (near the present town of Battle) close by Hastings on 14 October, where after nine hours of hard fighting and probably less than 30 minutes from victory, Harold was killed and his forces routed. His brothers Gyrth and Leofwine were also killed in the battle. The account of the battle, Carmen de Hastingae Proelio ("Song of the Battle of Hastings"), said to have been written shortly after the battle by Guy, Bishop of Amiens, says that Harold was killed by four knights, probably including Duke William, and his body brutally dismembered. Amatus of Montecassino's L'Ystoire de li Normant ("History of the Normans"), written thirty years after the battle of Hastings, is the first report of Harold being shot in the eye with an arrow. Later accounts reflect one or both of these two versions. 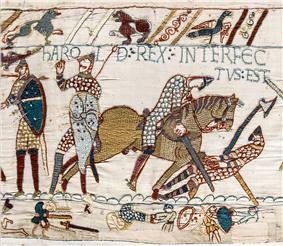 A figure in the panel of the Bayeux Tapestry with the inscription "Harold Rex Interfectus Est" (Harold the King is killed) is depicted gripping an arrow that has struck his eye, but some historians have questioned whether this man is intended to be Harold, or if Harold is intended as the next figure lying to the right almost prone, being mutilated beneath a horse's hooves. Etchings made of the Tapestry in the 1730s show the standing figure with differing objects. Benoît's 1729 sketch shows only a dotted line indicating stitch marks without any indication of fletching (all other arrows in the Tapestry are fletched). Bernard de Montfaucon's 1730 engraving has a solid line resembling a spear being held overhand matching the manner of the figure to the left. Stothard's 1819 water-colour drawing has, for the first time, a fletched arrow in the figure's eye. Although not apparent in the earlier depictions, the Tapestry today has stitch marks indicating the fallen figure once had an arrow in its eye. It has been proposed that the second figure once had an arrow added by over-enthusiastic nineteenth-century restorers that was later unstitched. A further suggestion is that both accounts are accurate, and that Harold suffered first the eye wound, then the mutilation, and the Tapestry is depicting both in sequence. "The two brothers of the King were found near him and Harold himself, stripped of all badges of honour, could not be identified by his face but only by certain marks on his body. His corpse was brought into the Duke's camp, and William gave it for burial to William, surnamed Malet, and not to Harold's mother, who offered for the body of her beloved son its weight in gold. For the Duke thought it unseemly to receive money for such merchandise, and equally he considered it wrong that Harold should be buried as his mother wished, since so many men lay unburied because of his avarice. They said in jest that he who had guarded the coast with such insensate zeal should be buried by the seashore". Another source states that Harold's widow, Edith Swannesha, was called to identify the body, which she did by some private mark known only to her. Harold's strong association with Bosham, his birthplace, and the discovery in 1954 of an Anglo-Saxon coffin in the church there, has led some to suggest it as the place of King Harold's burial. A request to exhume a grave in Bosham church was refused by the Diocese of Chichester in December 2003, the Chancellor having ruled that the chances of establishing the identity of the body as Harold's were too slim to justify disturbing a burial place. A prior exhumation had revealed the remains of a man, estimated at up to 60 years of age from photographs of the remains, lacking a head, one leg and the lower part of his other leg, a description consistent with the fate of the king as recorded in the Carmen. The poem also claims Harold was buried by the sea, which is consistent with William of Poitiers' account and with the identification of the grave at Bosham Church that is only yards from Chichester Harbour and in sight of the English Channel. There were legends of Harold's body being given a proper funeral years later in his church of Waltham Holy Cross in Essex, which he had refounded in 1060. Legends grew up that Harold had not died at Hastings but instead fled England or that he later ended his life as a hermit at Chester or Canterbury. Harold's son Ulf, along with Morcar and two others, were released from prison by King William as he lay dying in 1087. Ulf threw his lot in with Robert Curthose, who knighted him, and then disappeared from history. Two of Harold's other sons, Godwine and Edmund, invaded England in 1068 and 1069 with the aid of Diarmait mac Mail na mBo. They raided Cornwall as late as 1082, but died in obscurity in Ireland. (perh. (debated)) Æthelweard "the historian"
^ It could be argued that Edgar the Ætheling, who was proclaimed as king by the witan but never crowned, was really the last Anglo-Saxon king. ^ Edward may not have been blameless in this situation, as at least one other man, Sweyn II of Denmark, also thought Edward had promised him the succession. ^ At this time there were a range of spousal relationships, from outright concubinage to fully recognised, church-sanctioned marriages. There are no contemporary sources for Harold's marriages, just the writings of later Norman chroniclers, who had a more church-centered view, and also had motivation to diminish the status of Harold's children. Consequently, the exact status of the relationship between King Harold and Edith the Fair is unclear. ^ At midsummer in 1069, Brian and Alan the Black led a force that defeated a raid by Godwine and Edmund, sons of Harold Godwinson, who had sailed from Ireland with a fleet of 64 ships to the mouth of the River Taw in Devon. They had escaped to Leinster after the Battle of Hastings in 1066 where they were hosted by Diarmait. In 1068 and 1069 Diarmait lent them the fleet of Dublin for their attempted invasions of England. ^ Frank Barlow points out that the author of the Vita, who appears to have looked favourably on Harold, was writing after the Conquest and may have been intentionally vague. ^ This was in preference to Edward's great-nephew, Edgar Ætheling, who had yet to reach maturity. ^ His claim came through a succession pact concluded between Harthacnut, king of England and Denmark, and Magnus I of Norway, whereby the kingdoms of the first to die were to pass to the survivor. Magnus had thus gained Denmark on Harthacnut's death but had not pursued the other crown. Hardrada, uncle and heir of Magnus, now claimed England on this basis. ^ Historians do not accept that from January to September the wind was never favourable for an invasion as William claimed. It is generally believed he knew of Harald Hardrada's plans and waited for Harold Godwinson to be weakened or engaged with fighting in the north before he proceeded with his own plans. ^ Battles of the time rarely lasted more than two hours before the weaker side capitulated, nine hours indicates the determination of William. William's forces had already recovered from a near rout after reports he had been killed, but William raised his visor to prove he was alive and his men rallied. Battles were also not fought at night and as Harold would receive fresh reinforcements in the morning he was more or less assured of victory. Harold was killed shortly before sunset. ^ At midsummer in 1069, Brian of Brittany and Alan the Black led a force that defeated a raid by Godwine and Edmund, sons of Harold Godwinson, who had sailed from Ireland with a fleet of 64 ships to the mouth of the River Taw in Devon. They had escaped to Leinster after the Battle of Hastings in 1066 where they were hosted by Diarmait. In 1068 and 1069 Diarmait lent them the fleet of Dublin for their attempted invasions of England. ^ In re Holy Trinity, Bosham  Fam 124 — decision of the Chichester Consistory Court regarding opening King Harold's supposed grave. DeVries, K. (1999). The Norwegian Invasion of England in 1066. Woodbridge, UK: Boydell Press. Mason, Emma (2004). House of Godwine: The History of Dynasty. London: Hambledon & London. Moss, Vladimir (2007). "The Fall of Orthodox England: The Spiritual Roots of the Norman Conquest, 1043–1087". Rex, Peter (2005). Harold II: The Doomed Saxon King. Stroud, UK: Tempus. Round, J. H. (1885). "Adeliza (d 1066?)". Walker, Ian (2000). Harold the Last Anglo-Saxon King. Gloucestershire: Wrens Park.